I’ll admit, the first time I read Princess in Waiting, volume 4 of the Princess Diaries series by Meg Cabot, I wasn’t that excited. Don’t get me wrong, I think the series as a whole is great! But there’s something about book 4 that makes it different from the rest of the books. I thought about what that might be during this current read and I think it’s the fact that book 4 is missing controversy and build up to some big event. In Princess in Waiting the big event is Mia and Michael’s first date and the only controversy is Mia’s insecurities about how much Michael likes her. The first time I read this book I was kind of disappointed with the lack of excitement but this time around I kind of liked that quality. With all the drama and surprises of the first three books I was glad to relax a little in book 4 where Mia settles in for her second semester of high school and finds out what it’s like to be Michael Moscovitz’s girlfriend. 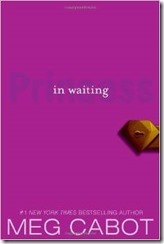 The other big difference about Princess in Waiting is the first half which takes place in Genovia, not New York City. Mia is, of course, bored to tears spending her Winter Break in Genovia, not to mention wild to see Michael. I, of course, loved reading about all the princessy deliciousness of the royal palace and all the activities Grandmère has lined up for Mia. Somewhere between the two of them – Grandmère and Lilly – must lie the truth to maintaining a successful relationship with a man. Hesitation notwithstanding , I still give this book a Shrimp Coma Mrs. B. This entry was posted in Uncategorized and tagged Meg Cabot, Princess Diaries, young adult. Bookmark the permalink.